“Never doubt that a small group of thoughtful and committed people can change the world. Indeed, it is the only that ever has” – Margaret Mead. Nnamdi Kanu, the leader of the Indigenous People of Biafra (IPOB) must have known this much. That was why he declared in one of his broadcasts that he was looking for only 100 committed Biafrans to achieve the separation of Biafra from the accursed Nigeria. But few weeks ago, on 30th of May 2018 (Biafra Heroes Remembrance Day), some groups of Biafrans, which described themselves as Biafra freedom-fighting groups had a meeting in Anambra State, where they exhibited their ignorance of this truth. They said they were forming a coalition to make it easier for them to secure Biafra independence from Nigeria. The coalition expressed the belief that their dream of getting Biafra would be a mere mirage if they continued to work individually. Leader of Movement for the Actualization of the Sovereign State of Biafra, MASSOB, Uchenna Madu who now doubles as the spokesperson of the about 15 pro-Biafra groups that formed the coalition posited that the need for them to "jaw-jaw" on the current approach being employed by different groups had become imperative in the struggle. He said the approach must be coordinated for the groups to achieve their goal, which is Biafra actualization, despite their ideological differences. He further noted that it would be irrational that different groups fighting for the same goal would be at one another’s throat instead of working and walking together to actualize their aspiration. The meeting which was held at Rojenny Sports Village, Oba in Idemili South Local Government Area of Anambra State, has other leaders from other pro-Biafra groups in representation. Speaking on a Seminar that was held on the day, Madu said the meeting was also held to make the 51 years’ anniversary of the declaration of Biafra as a republic by Dim Chukwuemeka Odumegwu Ojukwu. It is important to state that the coalition partners must have been motivated by other consideration than securing Biafra freedom. This assertion comes to mind knowing that it might prove counter-productive with the groups coalescing into one command. It seems not to know that in such a situation, once the leadership is taken out, the whole body would be in disarray as the good book states: “strike the shepherd and the sheep will scatter”. This is why many critics believe the coalition leaders were just agents of Nigerian government being used to set-up the groups for emasculation. Indeed, there have been reports that money exchanged hands between the government and many of the coalition leaders. One another plank, some other critics of the group believe it is either the coalition leaders were working in tandem with government to emasculate the groups or they were outrightly ignorant of history. According to them, if the leaders were not ignorant, they would have known that many past struggles had been successful simply because groups worked independently of one another with each focusing and operating from their areas of strength. They hold the view that it made it impossible for government to track each group and subdue at the same time. They gave ready examples with the human rights struggles of the 60s in the United States of America (USA) and the struggle against apartheid in South Africa. 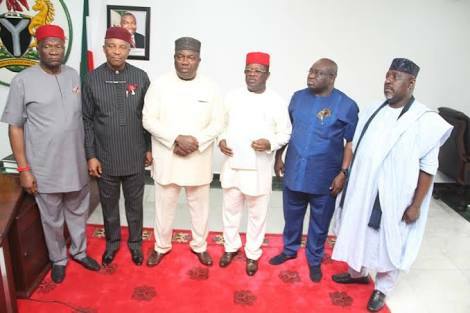 Expectedly, IPOB did not join the meeting. They were buoyed by such quotes of Margaret Mead above and the philosophy of their leader. Luckily for them, even though their leader asked for 100 men, millions are following them, which is crippling Nigeria on a daily basis. Indeed, when it called out Biafrans from the streets during the Heroes Remembrance Day, it was a total lockdown as more than 97 per cent of compliance was recorded. No wonder Lai Mohammed, Nigeria’s Minister of Information once declared that IPOB was more dangerous than any other group in the world, including the killer herdsmen that has caused serious security crisis in the country. For this reason, the coalition leaders should know that they were wrong in believing that they would be ineffective working alone. That means they were ignorant of the strength of IPOB’s non-violent strategy, that it was not just because of their number. They were just ignorant of that wonderful quote from Wendy Lesko that smallness is not limitation to effectiveness: “If you ever think you are too small to be effective, you’ve never been in a room with a mosquito”. IPOB have several other things going for it, which includes truth, honesty, trust-worthiness, determination, and non-compromise with anything Nigeria. If they should imbibe these and do them, they will also be effective.